View More In Heat Guns. 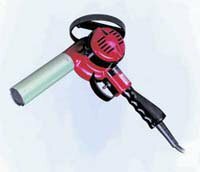 Heat Gun, 15 Amps, Adjustable Air Intake, Variable Temperature Control, 750 to 1100 DegreesWith break resistant mica heating elements. Replaceable brushes. Adjustable air intake regulators provible variable temperature adjustment within units range. Toggle switch (hot-cold-off). Includes circular safety stand. If you have any questions about this product by Eddy, contact us by completing and submitting the form below. If you are looking for a specif part number, please include it with your message.